1. Nice to have you with us, today, Sherry. Please tell us what inspired you to write Delivered with Love. I signed up for a mentoring clinic with James Scott Bell and needed the first three chapters of a novel. I love the coastal town of Capitola, California and thought the location would be fun place to set a story. I wanted to write a contemporary novel with romance and a hint of mystery. When I thought about an old love letter being found in the glove compartment of an inherited VW Bug, the story of Claire James, a young woman who had lost her mother to cancer, unfolded. 2. This is your first fiction title. Can you share a little about your road to getting published? How long have you wanted to be a writer, and how does it feel to see this “dream” fulfilled? 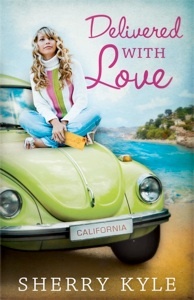 Delivered with Love is my first novel, but not my first published book. I’ve written a couple of children’s books, one being the newly released nonfiction book, The Christian Girl’s Guide to Style, for girls ages 8-12. I started writing women’s fiction in September of 2007. I credit writing friends, Mount Hermon Christian Writers Conference, and American Christian Fiction Writers for getting me this far. I’ve wanted to be a writer ever since taking my first course at the Institute of Children’s Literature in 1998, but I’ve always have had a vivid imagination. In the fourth grade, I won an award for a story I wrote titled, “Friends Can Be So Mean.” Honestly, seeing my novel in print makes my faith stronger. Through Christ all things are possible! I love to read, watch movies, and most recently joined Zumba at my church. 4. What are three things you’d like readers to know about you? I grew up in Colorado, but didn’t ski until I went to college in California. I learned to crack open a coconut in Tahiti. I’ve wanted to adopt since I was ten years old when I saw the movie “The Inn of the Sixth Happiness” starring Ingrid Bergman. How’s that for random? 5. I understand you had a nonfiction book release in the fall of 2010 for tween girls. 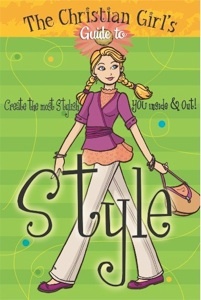 Having three daughters of my own, I’m very interested in A Christian Girl’s Guide to Style. Can you tell us why you wanted to write this book? Any more books like this in your future? Thanks so much for asking. I wrote The Christian Girl’s Guide to Style because girls get bombarded in today’s culture with what the world sees as important in the area of fashion and beauty from secular magazines, television and movies. The world teaches them that their outward appearance is all that matters. What a wrong message! While researching this topic, I came across Colossians 3:12-17. God gives us a blueprint of what He sees as important. We are to clothe ourselves with compassion, kindness, and humility to name a few. I wanted to combine biblical principles with fashion/beauty items so that girls can learn how to be beautiful inside and out! Thanks for asking what I have coming out next. I recently signed a book contract for The Christian Girl’s Guide to Your New Room all about planning, decorating, and organizing a girl’s bedroom while transforming on the inside too! 6. From your website, I see that you’ve written a couple of historical books. Do you find it more difficult to write historical or contemporary? Which do you prefer? It’s definitely more difficult to write historical because of the research involved. As you can tell, I like all different genres and am trying my hand at a few. Right now I’ll stick with contemporary unless one of my historical books sell. 7. Please share with us what you’re working on now and when your next fiction title will be released. I signed a contract for another contemporary romance with Abingdon Press titled The Heart Stone, to be released in the Spring of 2013. This book is about a diamond ring that is worn by a young single mother to ward off questions, but was offered to another woman forty years ago. And now the older woman is thinking about the man who asked her to marry him all those years ago. The story is about two women's journeys to find love and forgiveness. Sounds wonderful, Sherry. Thanks so much for allowing us to get to know you here at Country at Heart. 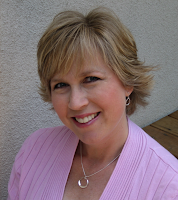 Readers, if you have a question you'd like to ask Sherry, I'm sure she'd love to visit with you!